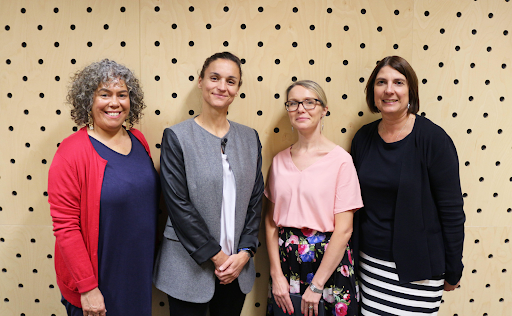 ​​​​​​​​​​​​​Monash College celebrated International Women’s day with inspiring speeches from powerful guest speakers, including keynote Melissa Barbieri, former Matildas' captain and veteran of four soccer World Cups. One hundred and thirty staff gathered at our 222 Bourke Street campus under the UN Women’s theme of ‘more powerful together’, to hear about gender equality, supporting women suffering economic abuse and how women can be empowered through storytelling. Melissa, a proud advocate of women’s rights in sport, spoke about her formative experiences as a young woman in soccer, who faced challenges because of her gender right from the start. Finding a club that would let a girl play was a challenge, and she was repeatedly told ‘no’. As a professional, she quickly understood that things in elite sport were different for women. But that didn’t stop her push for equality. Melissa also placed a strong emphasis on the importance of education in breaking down barriers, and had positive words for our teachers. The College’s Executive Director of Product Development and Innovation, Rachel Simmons, spoke passionately about the importance of economic rights for women and the realities of economic abuse. Rachel is a member of non-profit group POWER (Protection Of Women’s Economic Rights), and highlighted Australia’s standing when it comes to gender equality. The good news is that we are rated number one for gender equality in educational attainment. Fellow colleague Senior Learning Content Designer Sharon Whippy presented on a film called Vai, which she collaborated on with her sister and a team of Pacific Island female writers and directors. Fresh from a triumphant screening at the Berlin International Film Festival in February, Sharon turned her focus to the importance of using your voice and platform to speak up for communities who don’t get mainstream attention. Sharon also thanked the College for its support throughout the challenging creative process, which necessitated writing workshops and a location shoot in Fiji in order to bring the project to life. This hour of inspiration and enlightenment left its mark on the audience and presenters, and will serve as a reminder of the work done so far to bring gender equality to the education space, and the work that remains to ultimately reach the goal of a fair Australia.